Looking for Table Linen ? Table Linen We are engaged in providing an extensive array of Table Linen. Our products are availed in different of designs an...We are engaged in providing an extensive array of Table Linen. Our products are availed in different of designs and patterns as per the customer's needs and specifications and are made of finest raw materials. We offer this Table Linen at the best price in the market. Table Linen Our range of Table Linen is widely appreciated by our clients, which are situated all round the nation. Manufactured by usi...Our range of Table Linen is widely appreciated by our clients, which are situated all round the nation. 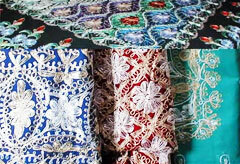 Manufactured by using high grade material, these Table Linens are available in various colors and designs. We offer these Table Linens at most reasonable prices to our valuable clients. Table Linens These Table Linens are made from very high quality raw material which ensures ...These Table Linens are made from very high quality raw material which ensures high durability at its user end. These Table Linens are available in various designer patterns and designs. 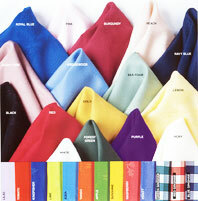 Table Linen Good Quality of Ta...Good Quality of Table Linen in Various Colors. Cotton Table Linens These high quality Cotton Table Linens are made from very high quality raw material due to which these Cotto...These high quality Cotton Table Linens are made from very high quality raw material due to which these Cotton Table Linens are widely demanded by all. These Cotton Table Linens are also customized according to our customers given specifications and needs. Linen is a material made from the fibers of flax. Linen yarn is spun from the long fibers found just behind the bark in the multi-layer stem of the flax plant. The quality of the finished linen product is dependent upon growing conditions and harvesting techniques. Linen fabric used as a cover for dining tables, study tables, display tables, etc. is called table linen. In earlier times, table linens were used as a sign of royalty and the poor people had no linens or even tables. 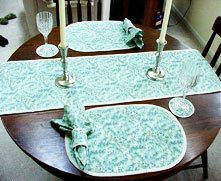 But today, table linen is used as a common decorative cover for tables. Flax is the raw material of linen grown as an annual spring crop grown both for its fiber and its seed. The stem of the fiber plant is slender and tall ranging from 25 to 125 cm in length in sparsely and heavily branched varieties depending on the regional conditions and climate. The fibre consists of the skin surrounding the woody core of the stem. The period of growth is about 90 days and the flax is pulled when the seeds begin to brown. There are over 200 varieties of flax plants, which is cultivated on primarily silt or clay loams in a moist and warm climate. It is traditionally grown in no more than twenty countries worldwide. The largest flax-growing country is Soviet Russia, which produces approximately 90 percent of the total flax crop of the world. Today flax is an expensive fiber and produced only in small quantities. The flax crop is either hand-harvested by pulling up the entire plant or stalks are cut very close to the root. It is very carefully harvest for valuable fibre would also be lost by the slightest injury. There are mechanical pulling machines but these are only applicable where the fields are large and in districts where the harvest is early and not subject to the August rains. The finest linen has a very consistent diameter with no knots. Linen is one of the oldest textile materials in the world the history of which goes back many thousands of years. Traces of linen thread dates back to the Neolithic times in Switzerland and the Bronze Age in Spain. Fragments of straw, seeds, fibres, yarns and various types of fabrics which date back to about 8000 B.C. have been found in Swiss lake dwellings. Linen was used in the Mediterranean in the pre-Christian age and as currency in ancient Egypt. Egyptian mummies were wrapped in linen, which was seen as a symbol of light and purity, and as a display of wealth. The finest linen cloths were spun as far back as 3,000 - 4,000 years B.C. in Mesopotamia, Assyria and Egypt. The ancient historian Herodotus mentions linen cloths where each thread consisted of 360 finest strands presented as a gift to Athena of Rhodos. Egyptian priests wore clothes made of linen that symbolized purity of light and fidelity. Linen was used to make clothes, combat outfits, bed wrappers, sailcloth and cordage and as canvas in painting in Greece that dates back to the 6th century BC. Ancient manuscripts of the 9th-10th century B.C. contain evidence of linen made by Slavs in Russia. The famous Turin Shroud that bears the image of Jesus Christ and was used to wrap his body is of linen. Even the towel bearing Christ's image, Redeemer, not painted by human hands, was also made of linen. Prior to the invention of paper, writers penned down their manuscripts on linen. Table linen was used during earlier times mainly by the royal and elite class. Gradually with the passage of time, and with the advancement of technology, this valuable fiber fabric began to be used by the common people. By the end of 18th century, the use of table linen elevated to a greater standard and matching table linen were introduced. Today blended table linen with cotton, polyester, jacquard, and other fabrics have been introduced in the market. 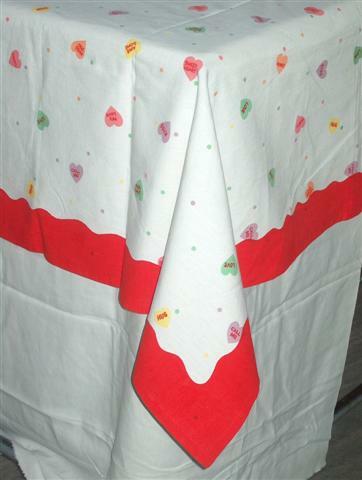 Along with domestic use, table linen began to be used for commercial purposes. They are now available in various colors, patterns and embroidered varieties were designed and woven. Flax tow is also used in the production of an effective filtering material applied in waste-cleaning processes.